In a recent research study, we asked insurance professionals: “what do you feel is your biggest challenge?” The response: 63% said attracting new business was their biggest challenge. This is unnerving because attracting new business is part of what keeps any agency running and profitable. To understand how to go about attracting new business, let’s first take a look at where consumers are searching when it’s time to make an insurance purchase. 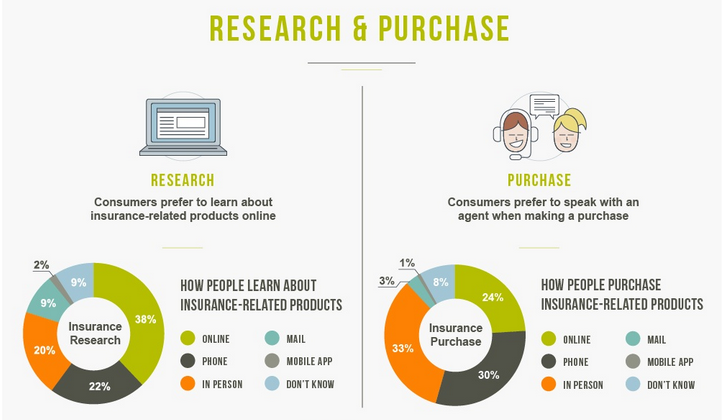 Research from Local Search Association showed that 38% of people search online before purchasing insurance products. With this data in mind, it makes sense that attracting new business starts online and the actual sale might be better suited in person or on the phone. Key take-away: you need to figure out how to generate leads online so that you can set up in-person meetings and ultimately write more policies. A lot of agencies try to generate (or buy) leads online, but the conversion results are often disappointing so they give up. 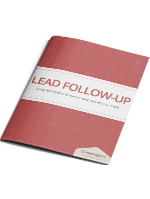 The results of generating or purchasing leads online are affected by a couple of things: quality of the lead and effectiveness of your follow up. First, some agents make the mistake of purchasing leads without doing a thorough investigation into where they come from and who else has access to those same leads. It’s best to work with a reputable lead vendor in the insurance space, like NextGen Leads, Precise Leads, and HPOne, to name a few. These vendors often offer different levels of leads you can buy that determines the type of lead, how “warm” the lead is, and who else has access to the lead. In most lead-buying situations, you get what you pay for. Often times, purchasing a mass list of cold leads (potentially at a lower price) isn’t going to have as high of conversion rate as buying leads who are warmer, yet likely more expensive. However, it isn’t just about where you get the leads from. Especially if you don’t purchase leads at all and simply gather them via a lead form on your website or in other ways online, it’s all about the follow up. When pulling up new leads or bringing them into your CRM is manual, it’s inevitable that it won’t always happen on the timely basis it needs to. Plus, the notification to agents to follow-up is then also manual, adding more time to the process. 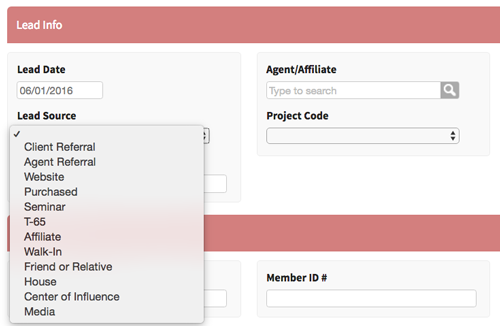 A fix for this is to have your website’s lead form integrated with your CRM or agency management system (AMS). AgencyBloc has built-in lead form capabilities to help you create your own form, embed it onto your website, and capture leads in real-time. This way, agents will get a notification immediately to follow-up. Many agencies also create an automated email to send once a lead fills out the form to notify them that someone will be reaching out shortly. To learn more about creating an effective lead form, check out our blog: How to Optimize Your Insurance Website Lead Form for Conversion. Next, there’s a concern that many agents are focused more on going out and finding their own leads versus letting leads come to them. Essentially, they’re prioritizing push marketing over pull marketing (or outbound over inbound). I think there’s a place for both in the insurance industry, but when automating things like lead form capture and lead follow-up are now simpler to do (like we discussed above), there’s no excuse to not be doing them. Agents should try to maintain a healthy balance between buying qualified leads and email marketing (outbound) and executing inbound tactics like promoting their lead form and offering educational content to prospects and clients. Lastly, the research suggests that distributing leads solely on geography and always trying to distribute leads evenly doesn’t allow agents to follow up instantly. However, each agency is different and needs to research and identify the best way to distribute leads and create a plan for automating as much of the process as possible to ensure quick follow up. 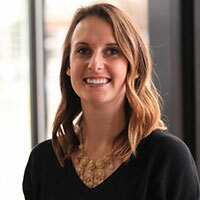 What one agency does for lead distribution isn’t going to necessarily work for the next agency, but learning best practices from other agencies is always beneficial. Key take-away: agents need access to the right tools to quickly follow up, and agencies need to automate some of the process for their agents. As we’ve discussed, whether you’re using paper files, spreadsheets, or an agency management system (AMS), you need to have a process in place for collecting, distributing, and following up with online leads. This process also needs to be measurable so that you can see what works and what doesn’t, so that your marketing dollars are being allocated appropriately. Your process, whatever it is, needs to be managed and measured to ensure that online leads are being handled according to your agency’s decided-upon process. The best and easiest way to set up a measurable process is to automate it using an industry-specific AMS. An agency management system can help you with the follow-up process internally and externally. Internally, an AMS keeps you accountable through the use of activities and/or automated internal emails. Examples of this would be an activity in AgencyBloc automatically being assigned to you when a lead comes in. Externally, AgencyBloc can send automated emails to jumpstart the follow-up process for new leads, or you can set up automated campaigns to send to prospects/leads. Whatever your process, you need a way to measure it so you can make more informed, strategic decisions about the future. In order to measure lead performance, you must be able to track all of your lead sources so that you can quickly pull reports or view real-time data analytics on them. 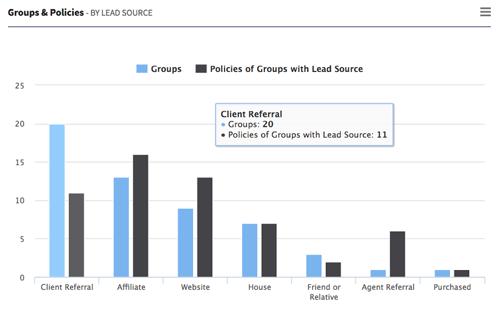 For example, the following graph shows various lead sources for an agency’s group clients and their current policies. From this, you can see what lead sources have been beneficial for your agency and which may need a closer look. Key take-away: using an agency management system will help you automate and track your follow-up process. Online leads are not all ready to make a purchase right away. This may be the biggest factor for disappointment with online leads. You may have done everything right: placed a lead form on your website, collected a lead, instantly distributed it to an agent, followed up within 5 minutes....and still didn’t write a policy. So what’s the deal? Online leads fall into your funnel at all different levels. Some are ready to purchase and others are only interested in the content you’re offering. A lead nurturing program allows you to build a relationship with online leads even if they’re not currently ready to purchase. When the timing is right, the relationship is already established, and it’s likely that the lead will turn to you for an in-person meeting. Drip and automated email campaigns combined with an automated and personal follow-up process is the best lead nurturing process for converting online insurance leads. Drip email campaigns are mass emails that are set up to send at a specific time in a specific order, and automated emails are triggered by an event or behavior. Many agencies use drip campaigns or mass emails to send “newsletter-like” content to their prospect and client lists. However, it’s not recommended to send the same content to everyone on your list. Make an effort to segment your list based on what they’re interested in and where they are in your funnel (prospect vs. client); then, send them content that will be relevant to them. For instance, agencies can run a specific cross-selling report in AgencyBloc and start an email campaign directly to those clients. As for prospects, you can segment them based on what type of coverage they’re interested in or even on dates and reach out accordingly. Agencies also utilize automated email to handle these communications. Automated emails are triggered when something happens. Something like a status change from prospect to client (onboarding messaging) or when a policy’s renewal date is approaching (renewal reminder messaging). Automated emails are a great way to be sure nothing falls through the cracks. When it comes to lead nurturing, continuous communication is key. It’s your job as an agent to provide the right information at the right time, and that’s where automating communication and having an AMS to document specific lead details can be extremely helpful. Key take-away: an agency management system with built-in email marketing capabilities is a powerful way to track and nurture leads. 80% of sales require 5 or more follow-ups. Learn how Automated Workflow in AgencyBloc can help you nurture and convert your leads.